There has been much written about the history of Winneconne. There’s a piece of the story, though, that has gone missing. 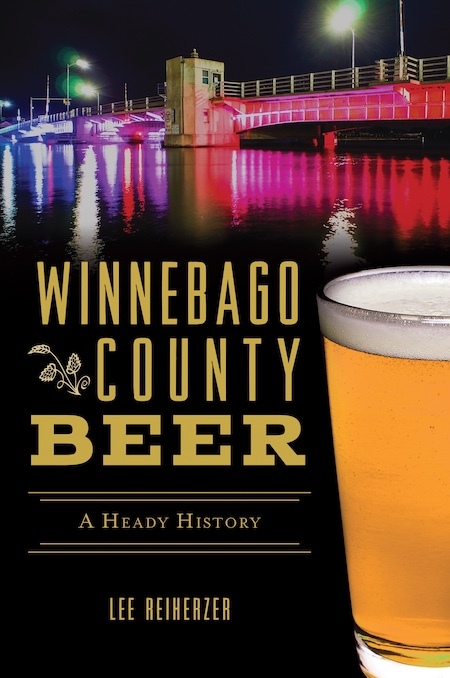 Histories of the Winnebago County village rarely make mention of the brewery that once thrived there. It’s an oversight that begs to be corrected. And it’s a story worth telling. It begins with a man named Theodore Yager. He was born in 1825 in what is now the state of Baden-Württemberg in southern Germany. As a young man in Baden, Yager received his training as a brewer. But Yager left his homeland during the upheaval that arose in the aftermath of the Baden Revolution of 1848. Sailing from Le Havre, France aboard the Ship Rhine, Yager arrived in New York City on April 28, 1851. He travelled to Wisconsin going to Dodge County where in 1857 he became a naturalized U.S. citizen. 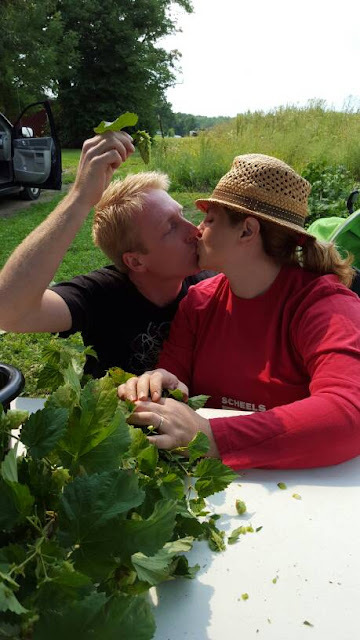 It was also in Dodge County that Yager married, Katharina Henrich, a woman 17 years younger than himself. By 1860, Yager and his 18-year-old bride had reached Winneconne. That spring the couple purchased a home near the northeast corner of what is now N. 3rd Ave. and E. Main St. Early on in Winneconne, Yager worked as a cooper making wooden barrels. It was a skill common to German trained brewers of his time, but obviously not one that Yager wanted to earn his entire living by. For the time being, though, brewing would have to wait. On January 29, 1862, Yager joined Company F of the 19th Regiment of the Wisconsin Infantry. He was off to the Civil War. Yager returned to Winneconne after his discharge in May 1864 as a Second Lieutenant. The first stirrings of the Yager brewery begin two years later. On July 21, 1866, Yager purchased a two-acre parcel of land on the east bank of the Wolf River near the south end of what was then named Water St. The property is within what is now the 500 block of S. 1st Ave. in Winneconne. There, Yager went to work constructing the frame building that would become his brewhouse. 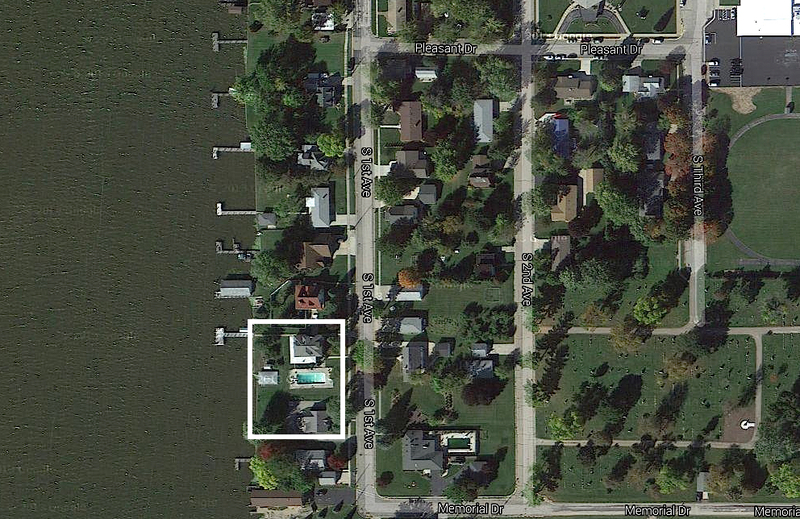 An ariel view of present day Winneconne. The approximate location of the brewery is framed in white. The Winneconne Brewery was typical of its period with Yager producing both ale and lager beer. His location on the bank of the Wolf would have been optimal for the production of his cooler fermenting lager beers. Years before mechanical refrigeration became commonplace in breweries, Yager undoubtedly benefited from the ready source of ice harvested from the river in winter. More than likely, Yager constructed lagering caves on the property to preserve the ice and extend the brewing season. The most reliable glimpse inside the brewery comes from 1870 when Yager mortgaged the brewery property. The document defining terms of the loan included a partial inventory of the Winneconne Brewery. • 14 large hogsheads (these would be wooden beer barrels with a capacity of 63 gallons). • 4 large malt tubs. • Malt mill and horsepower (i.e. a steam-powered engine). The date of the first beer to flow from Yager's brewery isn't known, but by 1868 the brewery was definitely operational. Yager could not have timed a better start. In 1868, the Milwaukee Road completed its track to Winneconne and transformed the sleepy village into something of a boom town. A recent history of the village describes the Winneconne of the period as a "Miniature Oshkosh with mills and factories turning out every wood product imaginable." 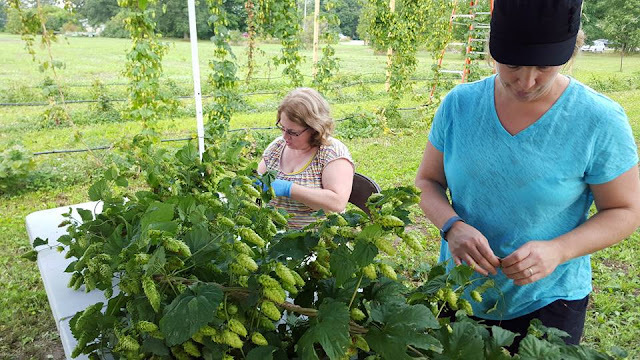 Winneconne's population spiked as people came seeking work. Many of them, like Yager, were German born and arrived with a well developed thirst for beer. As the only brewer in town, Yager found himself in the right place at the right time. An 1881 survey of Winneconne states that the brewery produced 400 barrels of beer annually. If correct, the number represents a significant output for a brewery located in a village with a population that still had fewer than 2,000 people. From the Winneconne Item; December 2, 1871. But Yager's early success would not be sustained. 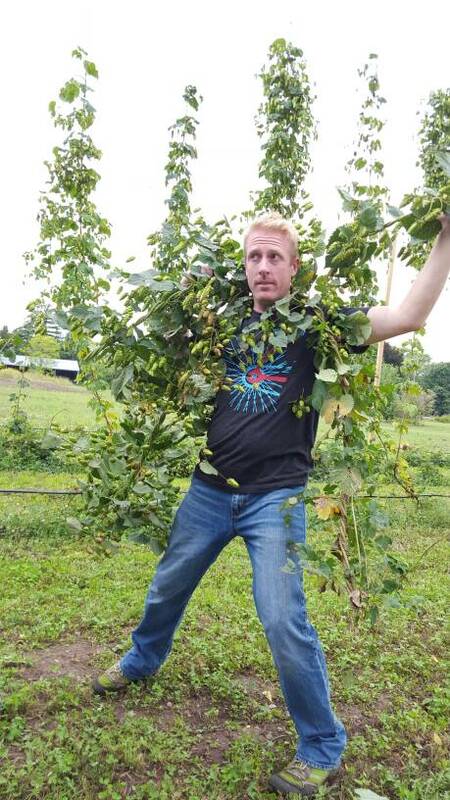 His brewery appears to have been caught in the drag when the Winneconne boom turned to bust. By the mid-1870s, forest lands along the Wolf River had been decimated by lumber interests. The lack of timber crippled Winneconne's mill works at a time when the nation as a whole was facing a severe economic recession. In Winneconne, mills closed while banks and businesses of all types failed. By 1880, the population of the village had plummeted by more than 40 percent to just 1,190. By that time, Yager was all but finished as a brewer. Production of beer at the Winneconne Brewery had slumped to just 78 barrels in 1878 and 83 barrels in 1879. Of the nine breweries in Winnebago County reporting output during these two years, Yager's was the least productive by a rather wide margin. When the Census of 1880 was taken in Winneconne, the 55-year-old Yager was again enumerated as a brewer. But the business was nearing collapse. 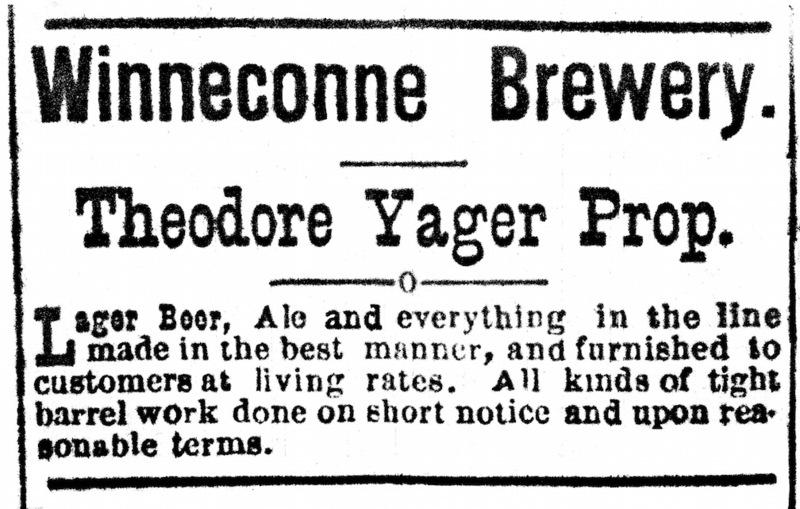 There may have been sporadic production as late as 1884, but by 1885 Yager's brewery was no longer listed among active breweries in Winnebago County. 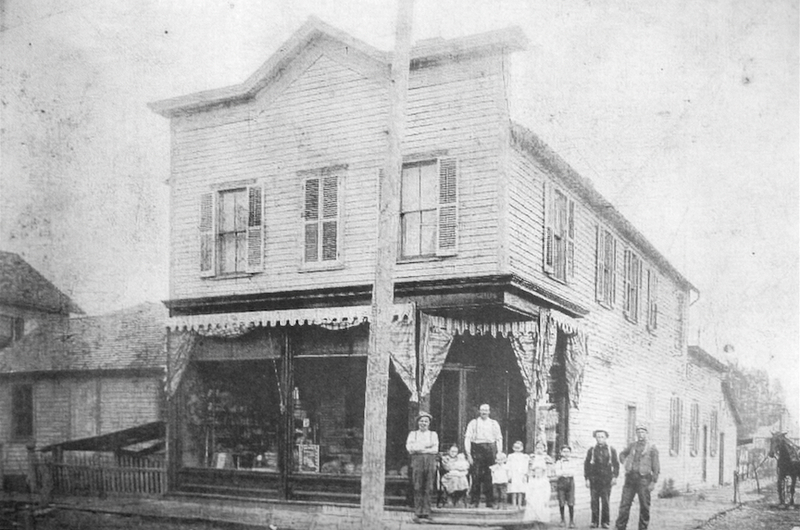 After the brewery closed, Yager remained in the village and for a time operated a grocery in Winneconne. Newspaper stories from the 1890s mentioning his name indicate that Yager remained well-known within the small community. It makes his absence from the histories of Winneconne all the more curious. A year after the 1891 death of his wife, Katharina, the 67-year-old Yager married again. The marriage ended five years later when his wife divorced him for "Lack of support." Theodore Yager died in Winneconne on September 6, 1899. He was 74 years old and still owned the land where he had once brewed beer. In 1901, his sole heir, an adopted daughter named Lucy, sold the property. Today there's nothing at the site giving an indication that a brewery once stood there. 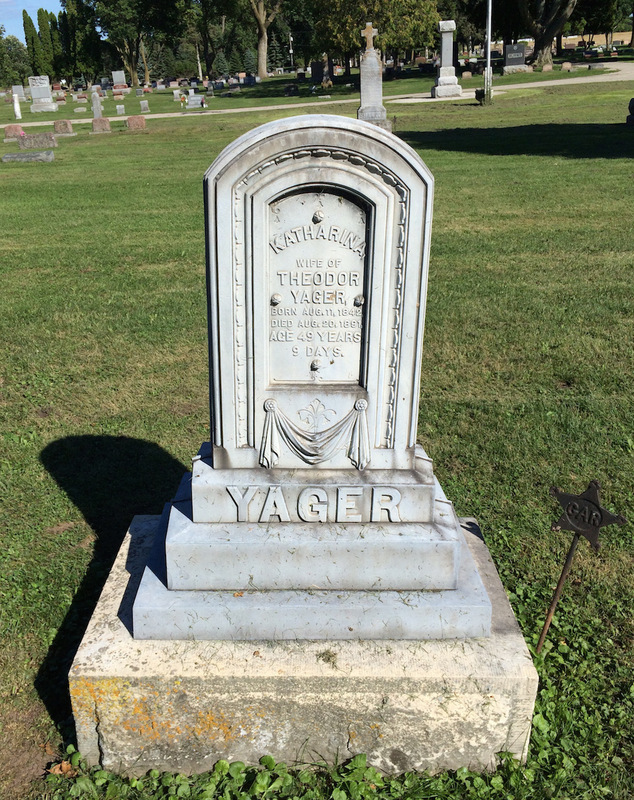 Though he is listed among those buried in the Winneconne Village Cemetery, there is no headstone for Theodore Yager. The only marker of his passing is the small Grand Army of the Republic badge planted beside the looming gravestone of his wife Katharina. It’s a vague memorial to the the life of an elusive man. Oshkosh Beer Show #16 - Red Alert! This week we’re drinking Hopsconsin, an excellent Red Ale from Great Dane Pub & Brewing Company of Madison, Wis. It’s a beautiful beer brimming with Wisconsin-grown hops. For the past three years, it’s been right about this time of year that you’d begin seeing posters pinned up around town for the Society of Oshkosh Brewer’s Casks & Caskets Homebrew Festival. You won’t see that happen this year. After last October's festival, state revenue officials let it be known that if the SOB's staged such an event again, there’d be consequences to pay. After three years of turning a blind eye to the festival, revenuers soured on the idea of the SOBs selling tickets to an event where all of the beer is homebrew. Or more importantly, as far as the state is concerned, beer that isn’t subject to taxation. This despite the fact that ALL of the money generated by ticket sales for the event went to a local charity – the Oshkosh Hunger Task Force. So there will be no Casks & Caskets this year or for the foreseeable future. And the thousands of dollars that would have gone to help feed locals in need will not be generated. That’s a damned shame. On Saturday, October 10 at the Oshkosh Public Library, a couple of those aforementioned SOBs (Jody Cleveland and myself) will present Oshkosh Brews! A Homebrewed Taste of Our Enduring Beer Culture. 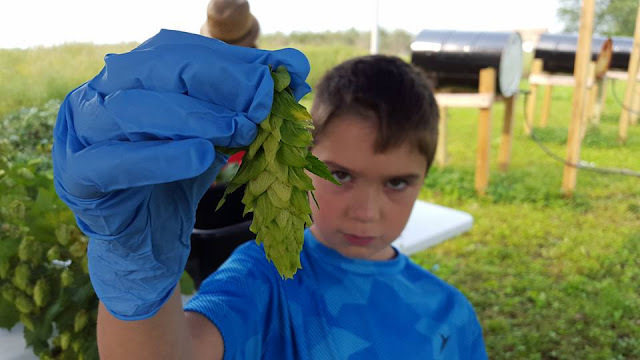 We'll explore the brewing process on the homebrew level and show how it relates to the culture of beer that has flourished in Oshkosh for more than 150 years. The afternoon will culminate with sampling of three homebrews informed by the history of brewing in Oshkosh. 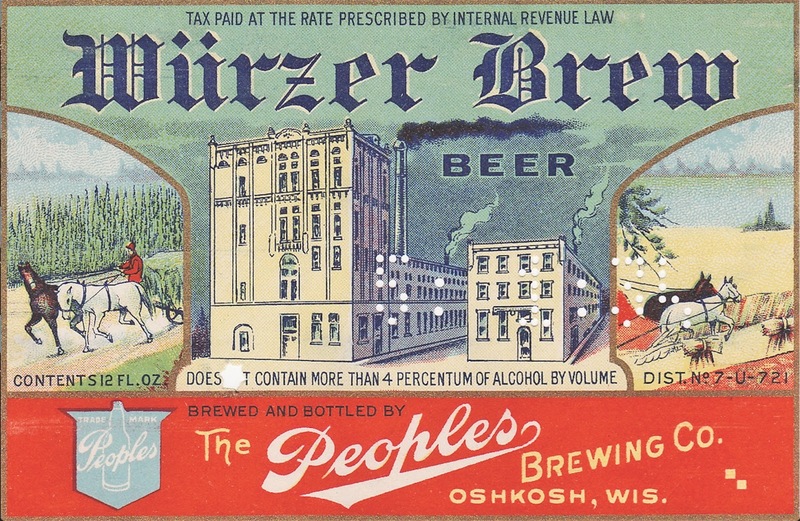 In addition to the presentation and beer, breweriana collectors Greg Putzer and Steven Schrage will be on hand to display their collections of memorabilia from Oshkosh's historic breweries. They're going to have some incredible stuff to show! The presentation and sampling will begin at 3:00pm and will last about an hour. We'd really like to make this a convivial affair, so if you have brewing memorabilia or memories about beer in Oshkosh, please stop by and share. I'll have more on this here in the weeks to come, but for now the full rundown and notes on the beer we'll pour can be found here. Imagine for a moment that the year is 1953. You're tooling around Oshkosh in a Hudson Hornet. You see all these weird looking guys walking around with shaggy beards. Oshkosh is celebrating its centennial and to mark the event a lot of men in town are letting their face hair grow long. What a strange place this is, you think to yourself. You snap on the radio. 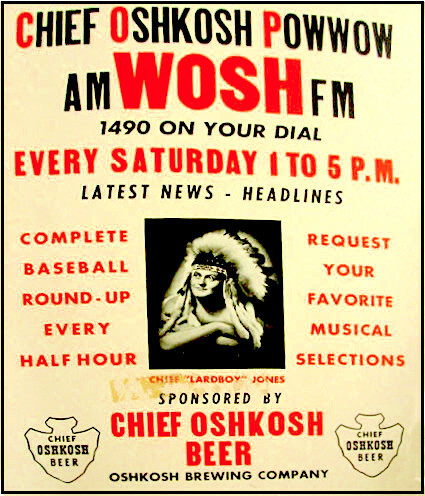 You tune in to WOSH and immediately get smacked in the ears with this fantastic piece of drivel (sung to the tune of the nursery rhyme Ten Little Indians). This week, we’re getting primed for Oktoberfest. Adam and I guzzle three festbiers, one German and two American to see how they compare. Prost! Has it already been a month? It has, which means it's time again for the 22nd installment of Gardina's Beer Bar Series. 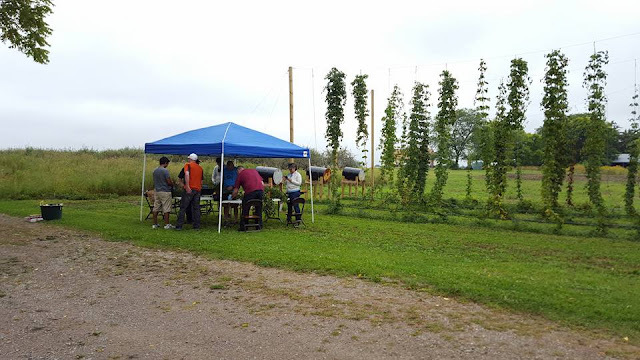 The featured brewery tonight (Tuesday, September 15) is Central Waters. Here's the rundown. 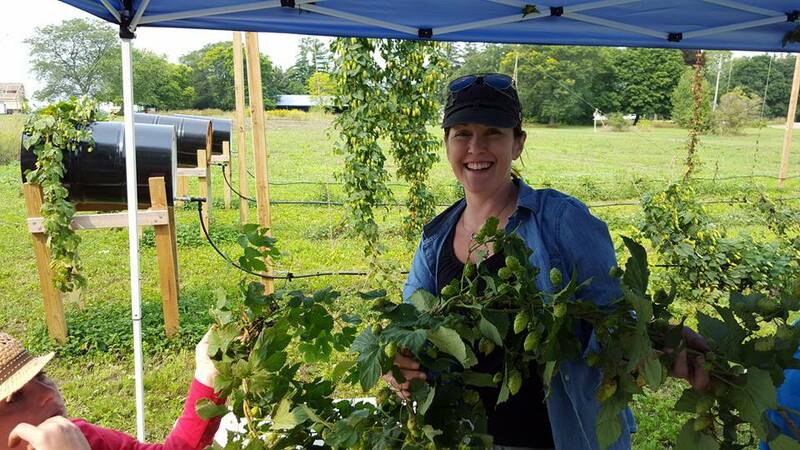 At 6 p.m., they'll tap a cask of Pumpkin Puppy Porter, a variation on Central Waters' Mudpuppy Porter that's been brewed with pumpkin and dosed with pumpkin pie spices in the cask. In addition to the cask beer, there'll be a mini-tap takeover with three other Central Waters beers on draft. Paired with a spinach salad with fresh cherries, crumbled goat cheese, walnut-balsamic vinaigrette, and spiced pepitas. Paired with a wild mushroom & spinach risotto served over caramelized sweet potato, finished with sage oil & parmesan. Paired with a braised beef short rib served over a kale and crisp prosciutto melange, finished with a pan jus lie. Paired with a cinnamon roll served over a butternut squash puree with toasted macadamia nuts and drizzled with a maple bourbon frosting. It all happens tonight beginning at 6 p.m. at Gardina's. A couple of photos of the same building at the northwest corner of 9th and Ohio Avenue. The images are separated by 116 years. This first picture is from 1899. It shows the building when it was a saloon and grocery store owned and operated by Joseph J. Nigl. Down below we’ll get into who some of those folks are standing in the doorway. And here’s how the place looked this past Saturday. This spot is central to the beer history of Oshkosh. It all starts with a family of German immigrants named Nigl. In 1872, Joseph Nigl Sr. moved his family from their Bavarian home to America. They arrived in Winnebago County in 1876. In 1881, Nigl purchased the lot where Ohio Street Station now stands. Nigl established a grocery store and saloon here in what would become the heart of Oshkosh’s “Bloody” 6th ward. His son, Joseph Jr. assumed ownership of the business in 1890. Both father and son are seen in the 1899 photo. Joseph Sr. stands at the left wearing a hat and white shirt with suspenders. Jospeh Jr., known as J.J., appears in the middle of the photo wearing a white shirt. He’s flanked by his six children. J.J. Nigl’s wife had died earlier in the same year this picture was taken. The saloon J.J. Nigl operated here, came to be known as the Gemütlichkeit, a German word that has no exact English translation. Coziness, friendliness and good cheer come close. In a neighborhood populated with German and Bohemian immigrants, the saloon’s name was indicative of the strong sense of ethnic identity that prevailed in the area. 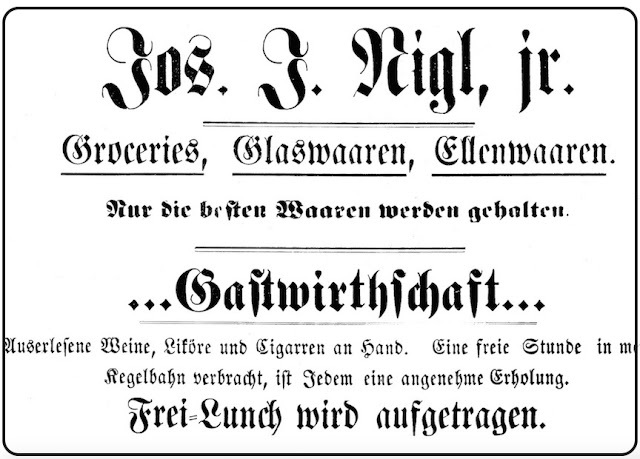 Here’s a German language ad for the Gemütlichkeit from 1902. 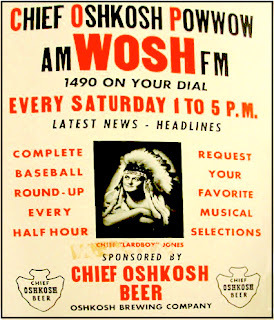 Any translation I’d attempt would result in butchery, but in general the ad highlights the saloons low prices, free lunch, bowling alley, and “Exquisite wines, liquor and cigars.” Nigl was also selling the beer of the Oshkosh Brewing Company. But that was going to change. 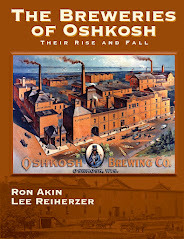 By the early 1900s, Nigl and other Oshkosh saloon owners found themselves increasingly at odds with the Oshkosh Brewing Company, which had come to dominate the Oshkosh beer market. 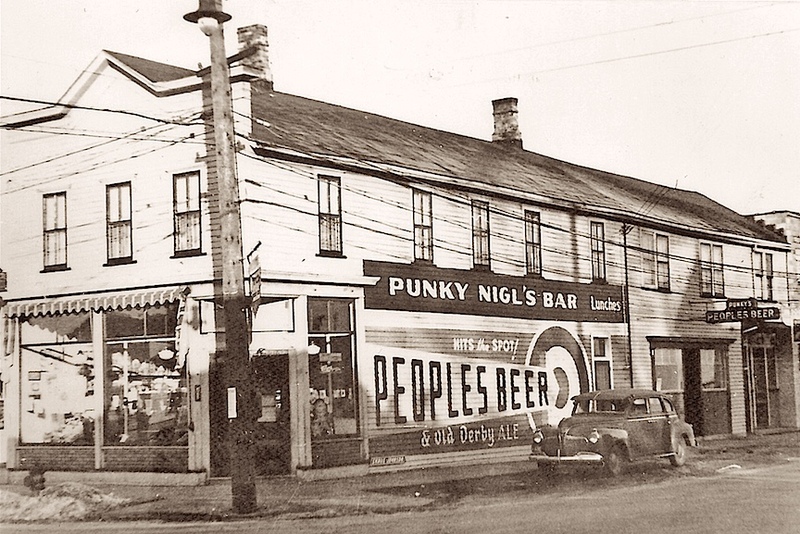 Nigl led a revolt against the brewery that culminated in the opening of Peoples Brewing Company of Oshkosh in 1913. The link between Peoples Beer and the tavern that operated here endured for more than 50 years. Here’s an example. This is a photo of the saloon from the 1940s when it was run by Alois “Punky” Nigl. The tie between Peoples Beer and the saloon was all but lost by the time Peoples Brewing closed in 1972. During the 1970s, the ownership and name of the tavern changed several time before becoming Ohio Street Station in 1980. The tavern is currently owned by Randy Syvrud, who purchased the property in 2007. If you’ve been by Ohio Street Station recently you may have noticed the sign in the window advertising that the tavern is up for sale. If the next owner decides to change the name, I have a suggestion: the Gemütlichkeit. This week we’re back on the IPA track drinking Pompeii from Toppling Goliath Brewing of Decorah, Iowa and talking about next week’s cask beer event at Gardina’s. This year’s Foxtoberfest pouring now at Fox River Brewing Company is fantastic. If you’re into malt, you’ll go for this one. It’s rich in toasted and caramel malt flavors, medium bodied, and has the clean finish you expect from a good Oktoberfest-style beer. They’ve been whistling through the beer at a rapid clip over at Fox River, so if this is your meat you might want to get over there sooner than later. OK, let’s get into the weekend. Since opening in May, Bare Bones Brewery has developed nicely. Most importantly, the Bare Bones taproom now features the brewery’s own beer on draft (they have an altbier in works that I’m especially looking forward to trying). Friday they’ll celebrate with a grand opening party. Beginning at 3 p.m., the taproom will offer $2 pints of Bare Bones beer and $3 pints of guest taps. They’ll also have live music from Pat Pedersen, a pig roast and yard games. I guess this makes it official: we have a new brewery in Oshkosh. At 2 p.m. O’Marro’s Public House will open its doors to celebrate 11 years of bringing good beer to Oshkosh. They’ll have food and drink specials throughout the day with four bands taking the stage over the course of the day and evening. The complete rundown is all right HERE. And here’s a look at how it all began back in 2004. Man, how time flies. This one goes from 3 p.m. to 6 p.m. and it's a great deal. If you buy your ticket in advance it's just $20. It's a mere $25 if you purchase it at the door. They’ll have over 100 beers to sample from more than 30 Wisconsin breweries. It all takes place under the big top in the parking lot in front of the pub with 100% of the proceeds going to benefit the Boys & Girls Club of Oshkosh. For tickets, stop in at the pub. 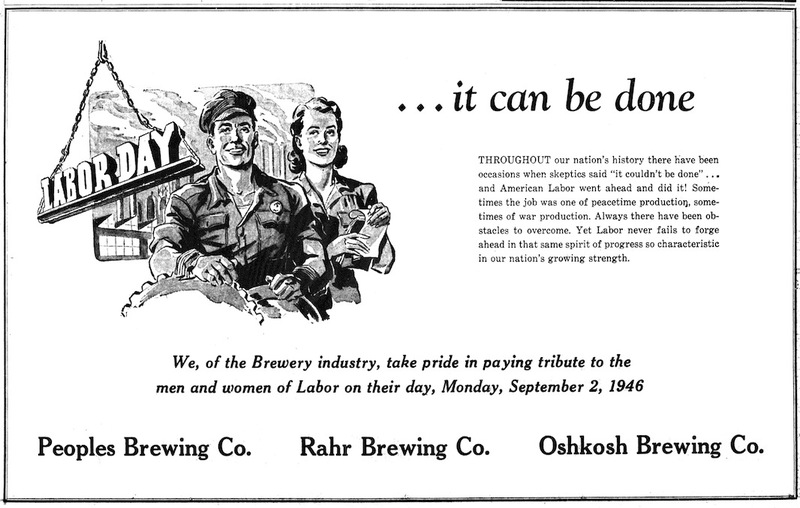 Every now and then, the breweries of Oshkosh would team up to publish an ad in collaboration. These typically occurred during times of stress. Here’s a good example. This ad was put out in advance of Labor Day 1946. World War II had been over for a year and Oshkosh was mired in the post-war recession that occurred as the country transitioned to a peacetime economy. In the face of the economic uncertainty that prevailed, Oshkosh’s three breweries teamed up to offer a message of encouragement... it can be done. Happy Labor Day! In this episode, we’re all about pumpkin beer. 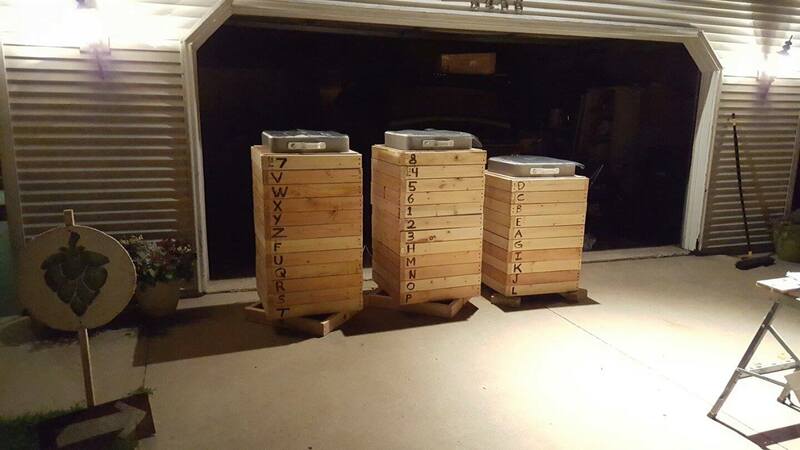 Love ‘em or hate ‘em, they’re unavoidable these days in Oshkosh. In this episode, we dip into what many consider to be the best pumpkin ale brewed in Wisconsin. It surprised me. 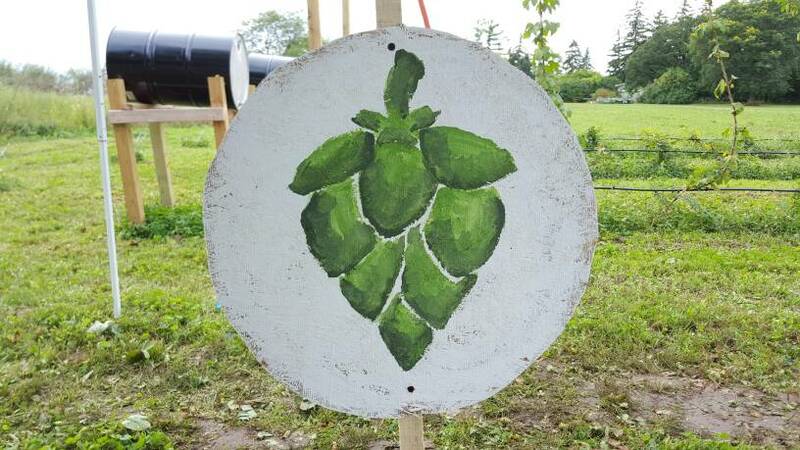 A quick follow up to last Tuesday’s post about Tim Pfeister’s hop yard in the Town of Algoma. This past weekend, Pfeister, family, and friends – 15 people in all – hand picked the yard clean. 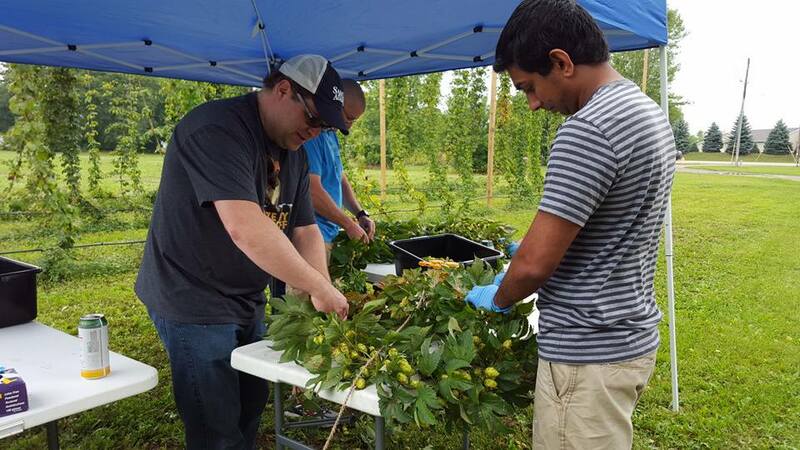 The 62 plants harvested took approximately 68 man hours to pick and netted a total of 77 pounds of hops. I can’t confirm this, but that may be the largest harvest of hops in Winnebago County in 125 years. It was an event worth remembering. 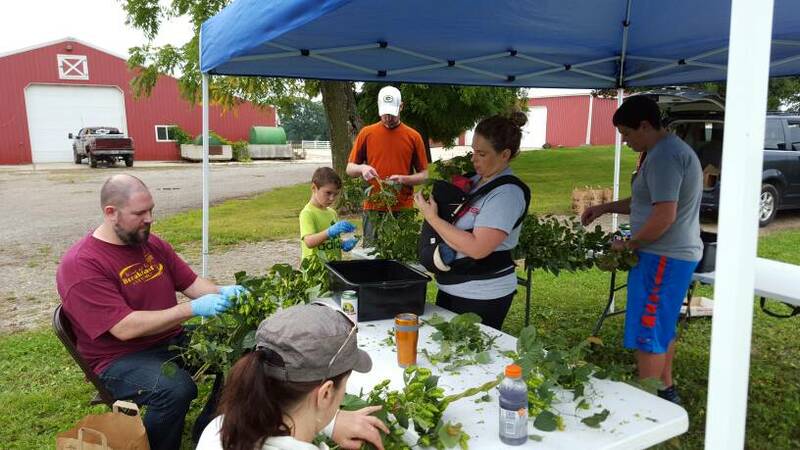 Here’s a few shots from the Saturday and Sunday harvest. 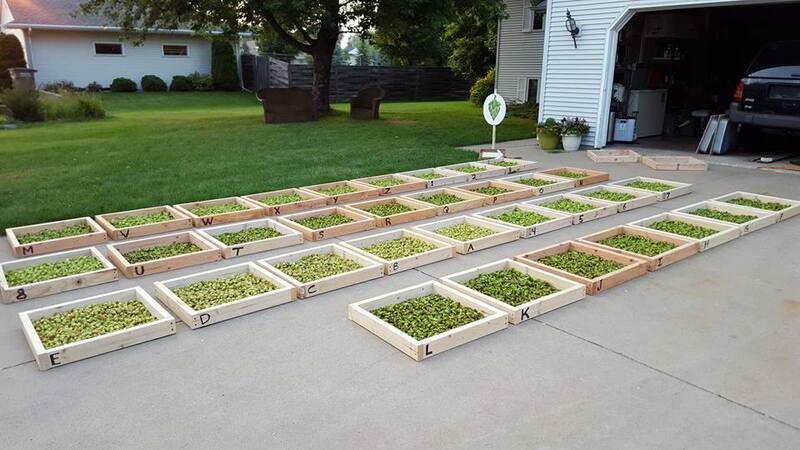 The hops laid out in panels that form the oast used for drying them. 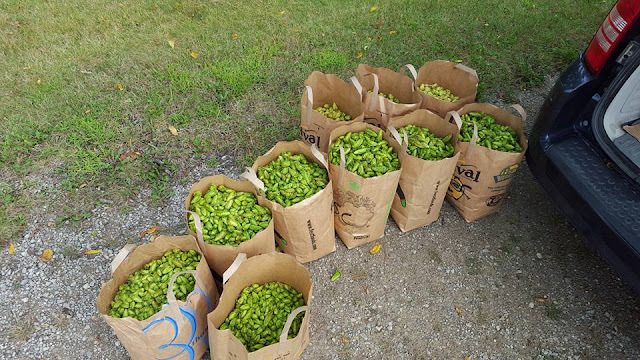 The oasts loaded with hops being dried.